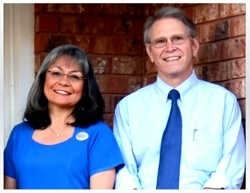 Welcome to the web site of Atlanta General & Implant Dentistry. Founded in 1988 by Dr. Steven H. Pratt, your Atlanta, Texas dentist, our clinic offers a wider range of services than many others in the four-state area. We are proud of our expertise in General Family Dentistry, Cosmetic Dentistry, Oral Surgery, and all phases of Implant Dentistry. In addition, we operate our own In-House Lab, significantly reducing our patients' wait for dentures, denture repairs, crowns, and several other procedures. Few area dental clinics offer this time-saving convenience. Our goal is to provide state-of-the-art dental care in a comfortable, knowledgeable, friendly environment. Dr. Pratt and his staff work tirelessly to stay abreast of the very latest techniques, procedures, and materials relevant to the ever-changing art and science of dentistry. We take pride in our work, and in the healthy, attractive smiles of our patients. We hope you'll find this site helpful. We've tried to anticipate some of your questions, describe some of our services, provide education about some common oral problems, and introduce ourselves. Of course, if you need more information of any kind, we'd be happy to speak with you personally. You can visit us at 903 West Main, in Atlanta, or call us at 903-796-6442.